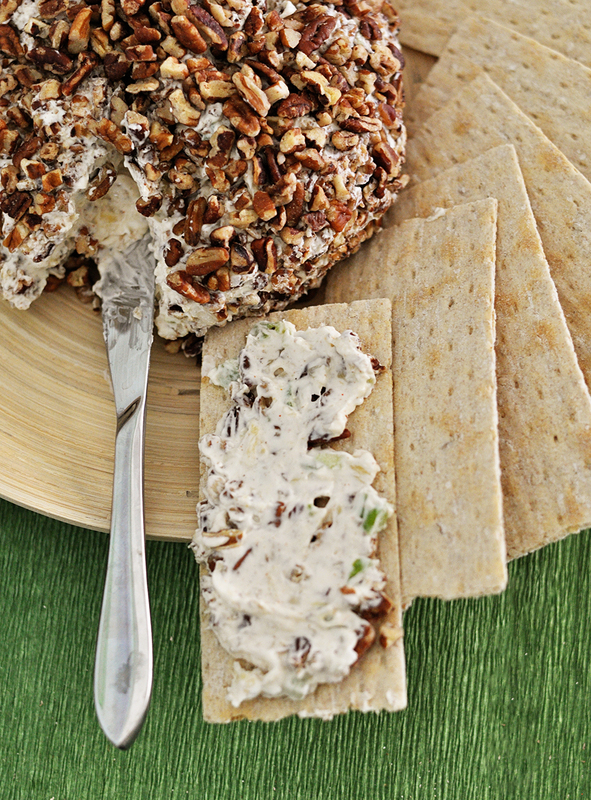 Savory Pineapple Cheese Ball - Real life, on purpose. A little over a year ago—at Christmas bunco, actually—a friend of mine made theee most delicious cheese ball. Usually I’m not a big cheese ball person. Give me slices of smoked gouda or swiss with my crackers, thank you very much. But this one was so tasty I kept compulsively snitching bites throughout the evening. When I finally asked what was in it, I was shocked by her answer: pineapple! For one thing, I couldn’t tell it was even in there until she said something. For another, isn’t pineapple usually a sweet food? Like, with fruit dip or in an upside-down cake or sprinkled with brown sugar and grilled? (And now I’m totally craving grilled pineapple. Dang it.) Whose crazy idea was it to put pineapple in a cheese ball? Then again, I love pineapple on pizza. Maybe savory is the way to go. At any rate, I was hooked. My friend kindly share the recipe with me, which I’ve tweaked just a bit. It comes together really quickly, but if you serve it with fancy crackers, people will assume it’s all kinds of gourmet. I especially love that I can load up several Wasa Thins Sesame & Sea salt crackers and go socialize instead of having to park myself by the food table all night. It’s the ideal party snack! Oversized, perfectly light and crunchy crackers, with just a hint of texture from the sesame seeds, topped with a thick shmear of savory pineapple cheese ball. YUM. And for those of you worried about the cookie overload heading your way with the upcoming holidays, relax! You’re getting all the food groups here! Bell peppers = veggies. Pineapple = fruit. Cream cheese = dairy. 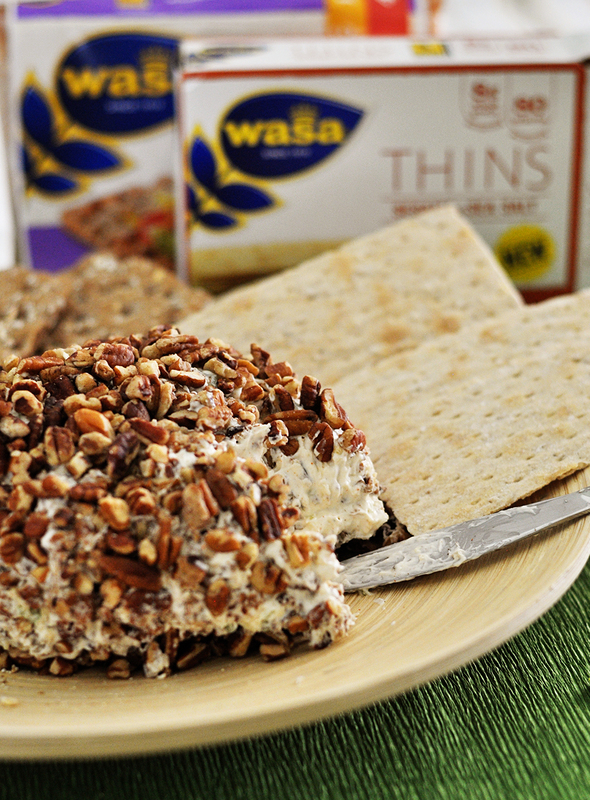 Wasa crackers = whole grains AND only 80 calories per serving (which, incidentally, is two humongous crackers). Score one for healthier living without giving up delicious holiday appetizers, amirite? In a medium bowl, stir together cream cheese, bell pepper, 1/2 cup of pecans, pineapple, onion, and seasoning salt until all ingredients are fully incorporated. Shape into ball (or log…or whatever makes you happy, I guess) and roll in remaining pecans. 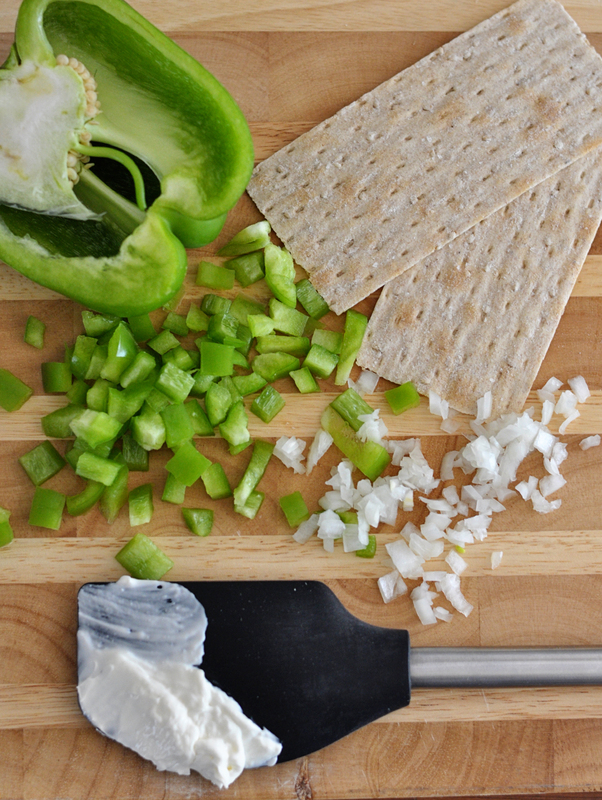 Serve with crackers, flatbreads, or cut up veggies. Store in fridge, tightly wrapped in plastic. My cheese was REALLY soft, so I probably should’ve refrigerated it for an hour or two before shaping it. (That’s why it’s kinda blobby looking in these pictures, and also why it’s covered in bigger pecans. I was trying to hide the uglier spots. I’m not a professional food blogger and cheese balls are not exactly the prettiest food anyway.) Anyway, if yours is soft too, get it nice and cold again before shaping it. Be sure to drain as much juice out of your pineapple as possible. Too much liquid will make everything all mushy and runny. I recommend chopping your peppers as finely as you chop your onions, not in bigger chunks like you see in one of the photos above. I went back and minced them up more before adding them to the cream cheese. Unless, of course, you like big chunks in your cheese ball, in which case, make ’em big. No judgement here. I felt like mine wound up a little heavy on the pecans; feel free to adjust that measurement as desired. Mix all ingredients well in a small bowl. Use to season all the (savory) things. If you double or triple recipe, just store whatever you don’t use right away at room temperature in an airtight container. 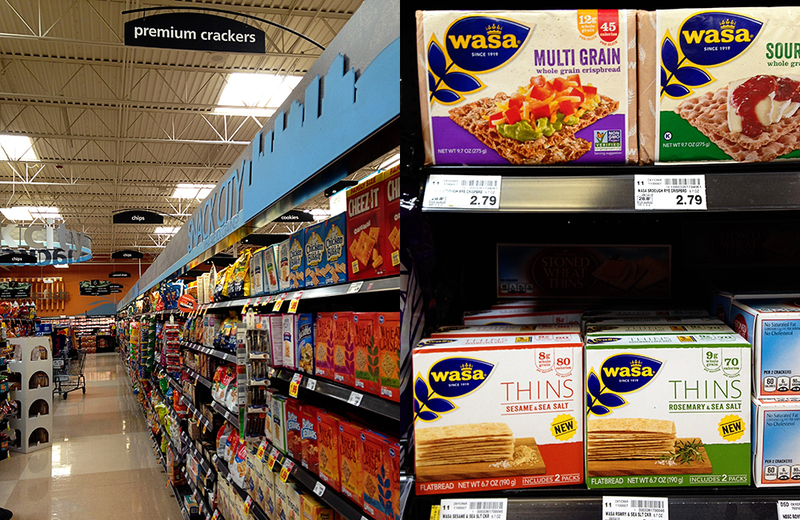 You can find Wasa Thins Sesame & Sea salt in the premium cracker section at your local Kroger store. We went to the Fry’s around the corner and grabbed a package of Wasa Multi Grain too. I can’t wait to try them with peanut butter and apple…or maybe some sharp cheddar and avocado slices… Food is my love language, guys. I am who I am. There are other Wasa options too; swing by their website to see all the varieties or go here to check out some great serving suggestions! There’s a picture of chocolatey something that is calling my name. 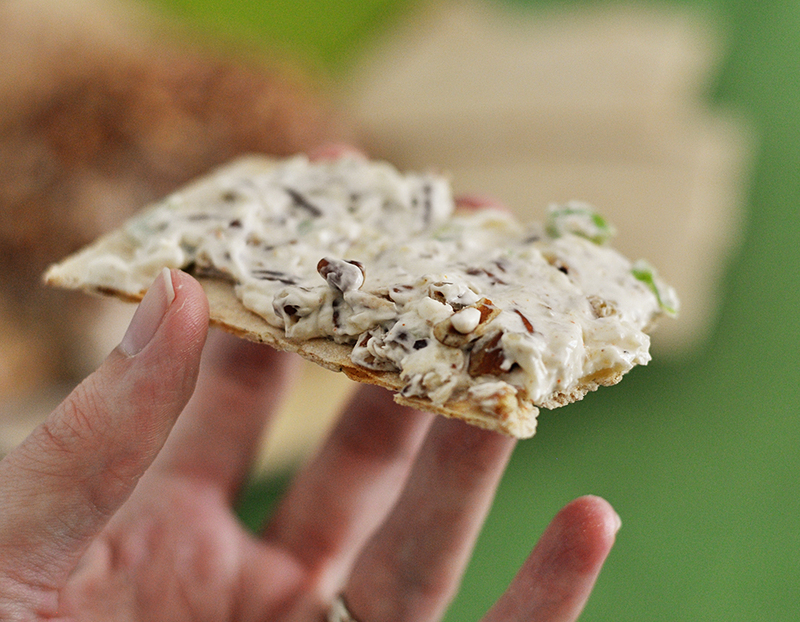 What’s your favorite appetizer to make or munch on at parties? Confession: if I’m around people and food at the same time, I almost can’t help but keep eating. Am I the only social eater? Please tell me I’m not alone! I make this cheese ball all the time, it’s wonderful and easy. You can use lowery’s season salt if you don’t want to make your own. Very tasty. This sounds so delicious! I’ve never made a cheese ball myself, but I pretty much like cheese in any form so I’d love to give it a go! Believe it or not, this was the first one I’ve ever made. It was SO EASY. Highly recommend giving it a shot. So much flavor! This looks delicious! I love trying new recipes. I would never think to add pineapple, but this sounds so good! OK! This looks delicious! Holiday season is my fave for all the good food! This was so easy to make and very delicious. Will make it again.